The most well-known and medically important blood types are in the ABO group. They were discovered in 1900 and 1901 at the University of Vienna by Karl Landsteiner in the process of trying to learn why blood transfusions sometimes cause death and at other times save a patient. 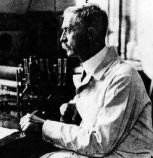 In 1930, he belatedly received the Nobel Prize for his discovery of blood types. All humans and many other primates can be typed for the ABO blood group. There are four principal types: A, B, AB, and O. There are two antigens and two antibodies that are mostly responsible for the ABO types. The specific combination of these four components determines an individual's type in most cases. The table below shows the possible permutations of antigens and antibodies with the corresponding ABO type ("yes" indicates the presence of a component and "no" indicates its absence in the blood of an individual). For example, people with type A blood will have the A antigen on the surface of their red cells (as shown in the table below). As a result, anti-A antibodies will not be produced by them because they would cause the destruction of their own blood. However, if B type blood is injected into their systems, anti-B antibodies in their plasma will recognize it as alien and burst or agglutinate the introduced red cells in order to cleanse the blood of alien protein. Individuals with type O blood do not produce ABO antigens. Therefore, their blood normally will not be rejected when it is given to others with different ABO types. As a result, type O people are universal donors for transfusions, but they can receive only type O blood themselves. Those who have type AB blood do not make any ABO antibodies. Their blood does not discriminate against any other ABO type. Consequently, they are universal receivers for transfusions, but their blood will be agglutinated when given to people with every other type because they produce both kinds of antigens. It is easy and inexpensive to determine an individual's ABO type from a few drops of blood. A serum containing anti-A antibodies is mixed with some of the blood. Another serum with anti-B antibodies is mixed with the remaining sample. Whether or not agglutination occurs in either sample indicates the ABO type. It is a simple process of elimination of the possibilities. For instance, if an individual's blood sample is agglutinated by the anti-A antibody, but not the anti-B antibody, it means that the A antigen is present but not the B antigen. Therefore, the blood type is A. Both A and B alleles are dominant over O. As a result, individuals who have an AO genotype will have an A phenotype. People who are type O have OO genotypes. In other words, they inherited a recessive O allele from both parents. The A and B alleles are codominant. Therefore, if an A is inherited from one parent and a B from the other, the phenotype will be AB. Agglutination tests will show that these individuals have the characteristics of both type A and type B blood. CAUTION: the inheritance of ABO blood types does not always follow such straightforward rules of inheritance. If you wish to explore the reason why this is true, select the Bombay Phenotype button below. ABO Blood type antigens are not only found on the surface of red cells. They are also normally secreted by some people in their body fluids, including saliva, tears, and urine. Whether someone is able to secrete them is genetically controlled. Police agencies now routinely use this so-called secretor system data to identify potential victims and criminals when blood samples are not available. Despite the fact that the blood types of children are solely determined by inheritance from their parents, paternity in the U.S. and many other nations can no longer be legally established based on conventional blood typing. To do that, it is necessary to compare HLA types and/or DNA sequences. The use of DNA is more accurate in determining paternity, but it is also more expensive than HLA typing. Antibodies to alien antigens in the ABO group are usually present in our plasma prior to the first contact with blood of a different ABO type. This may be partly explained by the fact that these antigens are also produced by certain bacteria and possibly some plants. When we come in contact with them, our bodies may develop long-term active immunity to their antigens and subsequently to the same antigens on the surface of red blood cells. This usually occurs in babies within the first six months following their birth. While blood types are 100% genetically inherited, the environment potentially can determine which blood types in a population will be passed on more frequently to the next generation. It does this through natural selection. Specific ABO blood types are thought to be linked with increased or decreased susceptibility to particular diseases. For instance, individuals with type A blood are at a somewhat higher risk of contracting smallpox and developing cancer of the esophagus, pancreas, and stomach. People who are type O are at a higher risk for contracting cholera and plague as well as developing duodenal and peptic ulcers. Research suggests that they are also more tasty to mosquitoes. That could be a significant factor in contracting malaria. NOTE: A small number of people have two different ABO blood types. They are not simply AB codominant. Apparently, most of these blood chimera individuals shared a blood supply with their non-identical twin before birth. In some cases, people are unaware that they had a twin because he or she died early in gestation and was spontaneously aborted. As many as 8% of non-identical twins may have chimeric blood. Some people are microchimeric--they have a small amount of blood of a different type in their system that has persisted from a blood transfusion or passed across the placental barrier from their mother before birth. Likewise, fetal blood can pass into a mother's system. This fact has led some researchers to suggest that the significantly higher frequency of autoimmune disorders in women is a result of the presence of foreign white blood cells that had come from their unborn children during pregnancy. Copyright © 1999-2014 by Dennis O'Neil. All rights reserved.